The HPA V281 was developped with the target to enable ultimate transmission quality for low- , medium- and high-impedance headphones. Due to its specific, variable, low-noise and low-distortion circuit design especially optimised for dynamic headphones, the HPA V281 fulfils even most sophisticated demands. HPA V281 is one of the few headphones amps made in Germany offering a balanced headphone output !! Furthermore HPA V281 offers selectable inputs and an output management. LOW-NOISE because of low internal gain. Therefore the self generated noise from the amplifer is not audible. HIGH OUTPUT VOLTAGE through 60 Volt internal operating voltage. Therefore best suited for high impedance headphones. Over 90 % of all headphone amplifiers in the market offer not half that voltage !! HIGH OUTPUT POWER because of powerful amplifiers able to deliver much more current a headphone needs. Therefore best suited for low impedance headphones and even magnetostatic cans !! HIGH DAMPING FACTOR through lowest output impedance. Therefore best suited for full control even over critical headphones with the garantee to have flatest possible response. The inputs and outputs are situated on the rear panel, they are equipped with electronically balanced gold plated XLR connectors and unbalanced gold plated RCA connectors. This amp may be additionally equipped with one of six different digital inputs: Coaxial, optical or USB with either 24/96 kHz or 24/192 kHz Balanced and unbalanced line outputs on the rear panel. These can be set to have fixed output level (mirrored from the input) or variable output level from the volume control. Volume control is provided with a high-grade ALPS RK 27 pot with a large full metal rotary knob. Additionally a balance control serves to correct the stereo image. V281 incorporates 4 times the award winning famous 8-transistor (per channel) amps from V200 for a smooth and relaxed sound stage und true balanced headphone outputs. The output management enables the amp to act as your personal preamp when desired. Feel free to activate the headphones outputs or the line outputs independently from each other with dedicated buttons on the front panel. Lots of protection circuits will care for the safe operation of your headphones. Two headphones may be connected via 1/4" jacks on the front panel. One balanced headphone may be connected via a 4-pin XLR socket on the front panel. Case and back panel are made of aluminium and are Nextel coated. The 8 mm aluminum frontpanel is milled, sand blasted and anodized. The labeling is laser engraved. Amplifier gain: +8 dB unbal. / 14 dB bal. Output impedance: < 0.1 Ohm unbal. / < 0.2 Ohm bal. Damping factor (Load 50 Ohm): 500 unbal. / 250 bal. 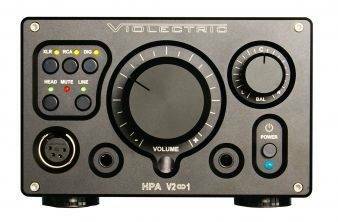 Related links to "Violectric HEADPHONES AMPLIFIER HPA V281"
Customer evaluation for "Violectric HEADPHONES AMPLIFIER HPA V281"
erst einmal noch "Frohe Ostern"!!! Wir hatten am Samstag mal wieder ein langes KH-Freunde treffen und haben uns diesmal den Röhren abgewandt und mal die Transistorverstärker diverser Hersteller gehört. Für Dich sind diese Erfahrungen ja auch immer mal wieder interessant. Aber wir waren uns diesmal sehr schnell einig. Die Kombi aus Violectric V281 und V850 hat alles andere in Grund und Boden gespielt. Ein phantastischer DAC mit einem phantastischem KHV die wie aus einem Guss spielen. Extrem dynamisch, extrem feinauflösend mit großer Bühne und unendlichen Kraftreserven. Das ganze sehr musikalisch und röhrenähnlich. Solltest du mal einen Kunden haben der definitiv den besten Transistor KHV sucht und dazu einen genialen DAC, dem solltest du diese Kombi ans Herz legen. Das ganze geht dann vom Sound her auch noch ein wenig in Richtung Röhrensound. Echt TOP!